A bullet penetrated the stomach of a community crime-fighting farmer who intervened in the robbery of a G4S vehicle. The farmer, who was shot while in pursuit of the armed robbers involved in yesterday’s cash-in-transit heist, was admitted to a local hospital where he is said to be in a stable condition, Vryheid Herald reports. Martin Dedekind, a farmer in the Piet Retief area, was one of many community crime fighters who came swiftly to the aid of the police, to try and bring the perpetrators to justice. His attempts were thwarted when he tried to stop one of the two vehicles being used by the robbers before they could proceed along the bridge just before Commondale near Piet Retief. The gunmen in the second vehicle came up behind Dedekind and opened fire, with one of the bullets penetrating Dedekind’s stomach. 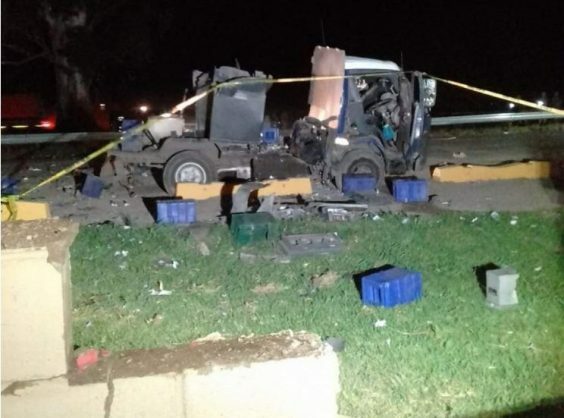 Less than two hours prior to the shooting, the robbers had attempted to force a G4S cash-in-transit vehicle off the road by colliding with it as it went over the speed bumps near the Tea Cup in Scheepersnek, Vryheid. When the driver refused to stop, the gunmen fired at the vehicle’s tyres, forcing it a standstill. One of the G4S guards Delani Sibiya was critically injured when shots were fired, having sustained a bullet wound to the head. The driver and crew of the G4S van were ordered to exit the vehicle at gunpoint and told to lay on the ground as the robbers detonated explosives to gain access to the money at the back of the van. Some of the gunmen waved their rifles at passing motorists directing them away from the crime scene. Several vehicles are believed to have been used by the robbers during the heist and in their attempts to make a getaway. Police who were first on the scene indicated that the robbers had been occupying two BMWs when they forced the G4S vehicle to a stop. The robbers then proceeded past Paulpietersburg to the Piet Retief area, where the shootout with Martin Dedekind took place. Here, the robbers once again abandoned the vehicles they were using, this time in favour of a Quantum combi. At the time of publishing, it was believed that the robbers were heading toward Pongola in the combi, but this information could not be confirmed.